Because of our love of mind mapping, the XMind team came together from different parts of China to create XMind. On April 1st, 2007, we released the first English version of XMind in Beijing. • XMind must be very easy to use. • XMind should increase user productivity with a fun to use interface and powerful functionality. • XMind should be accessible so that more people can benefit from mind mapping. Every good tool must be easy to use. But this does not mean simple. In fact, some look-simple tools are not easy to use. Easy-to-use is a design concept that gives people a certain feeling while using a tool. For example, XMind allows users to create a subtopic with the Tab key. The result is that people can easily mind map with a shortcut keystroke that makes sense. Some users have described this feature as Enter spreads your ideas, and Tab digs one idea. It greatly enhances usability. The need to focus is very important for building a mind map, especially a big one. Drilldown provides a perfect solution. Selecting a topic and clicking F6 brings you into a branch level, where you can focus on the topic for that branch and its associated subtopics. Navigation is easy too. We can choose to see all topics in a classic style outline viewer or via the diagrammatic Overview viewer. Outline view shows the entire map content in a traditional linear way, which sometimes helps in digesting the map concepts. BTW, we can directly edit topic content in this viewer. Overview view offers us the flexibility to see and navigate through content on the map. Left-clicking the mouse allows us to move any part of the map into the center. Scrolling the mouse wheel allows us to quickly zoom in or out on the map. Presentation is an easy task in XMind because of the Presentation Mode. No matter which topic we are on, clicking F5 will bring us into this special mode. All topics are hidden except the Central Topic, which is at the center and highlighted. Now, by hitting the space key in succession, each main topic is revealed one by one, centered and highlighted instead of the central topic. In fact, we can pick out more. All of these features, while powerful, were designed with ease of use in mind. When we decided to enter the mind mapping software market, we wanted to provide functionality that was not only easy to use, but fun to use and productivity-enhancing. We didn’t find a mind mapping tool in the market that provided all of these aspects, so we took on this challenge with XMind. Since releasing XMind, we’ve received lots of positive feedback about the user interface, that it’s pleasing to the eye. We believe having an attractive interface makes work tasks more fun and greatly enhances productivity. We’ve also received many accolades for our Multiple Sheets functionality within the main view. Similar to how a spreadsheet workbook allows you to have multiple sheets within that file; we can create multiple sheets within a single XMind file. Searching, finding and navigating content is much easier this way. Instead of having to open and close various files, or follow links and navigate away from a starting point, users can easily click between different sheet tabs for maximum efficiency in perusing various map content. Other functionality for finding and sharing content within XMind makes it an essential productivity tool. If we want to find something in a single map, normally Find and Replace (Ctrl+F) will be good enough. When we have many opened maps, with some having multiple sheets within them, Powerful Search view will be a great assistant. In this viewer, we can search any content in all opened workbooks. The search results are listed as a tree with a clean looking format. We can get to the content we need to find quickly and efficiently. XMind can export map content to other file formats such as Image, PDF (Map), PDF (Document) , HTML, etc., for fast sharing. XMind also offers another free sharing solution, XMind Share. Suppose you’re a teacher and a mind mapper. You want to share some special class content with your students in a non-public way. Just open the map in XMind and sign-in with your XMind Account (free to set up on www.xmind.net). Click the Upload button on the toolbar, select Unlisted in the privacy controls, and upload the map to XMind Share. This map will be assigned a unique URL, which you can provide to your students so that they can go and read the map online or download it to their own computers. Note that people without the URL will not be able to get to your map and it won’t be searchable in Google. When we started XMind four years ago, we had the vision of exposing as many people as possible to the power of mind mapping. We believe that XMind Open Source is a great way to achieve this vision. This open source version of XMind has many features which meet most peoples’ basic mind mapping requirements. More importantly, it incorporates all of the design rules mentioned above, namely easy to use, fun to use, and productivity-enhancing. Along with XMind Open Source, we also offer XMind Pro, which has more advanced business features such as Presentation mode, Audio notes, TaskInfo view, and Gantt chart viewer. XMind Pro is subscription-based software with a very reasonable entry–level fee. Remaining true to our principles has gotten some results that we are really proud of. Earlier this year, XMind surpassed the half a million user mark, and our user base continues to grow exponentially as more and more people discover the power of XMind. Finally, we want to say a big Thank You to all of XMind users who have sent feedback via email or left messages via Twitter, Facebook, and our user forums, or just support us quietly. No matter whether its praise, suggestions, or criticism, your support provides the fuel for the XMind Team to keep working hard and make XMind better and better. We don’t make it easy; do we? We mind-visual-knowledge mappers may be our own worst enemies, when it comes to establishing the tools, methods and mindset of our respective interpretations. And the interpretations are so numerous they read like a course in theology. We more than likely use the term mind mapping as an SEO advantage, as it is the most popular term used when searching the web for Visual thinking as a whole. Maybe the term is a semantic issue for some of us too, after all, some use the term mind map and visual map as if they have the same meaning and function. Buzan mind mapping is excellent for those who feel comfortable with using traditional buzan hand drawn radiant maps, the laws of Buzan mapping, and now the rather interesting and successful software from ThinkBuzan named iMindmap. A note of recognition; it is accepted that Tony Buzan formalized Buzan hand drawn Mind mapping. Mr. Buzan is responsible for the Genesis of Mind mapping, and is without a doubt ultimately responsible for the motivation behind many of the visual mapping products we now use. Nick Duffill of Harport consulting states; “My current assessment is that Mind Mappers are annoyed at software developers for hijacking their brand, and software developers are kicking themselves for hijacking a brand that comes with so much baggage that makes its reception unpredictable in a business environment. Both though have done well out of the relationship”. Within business at industrial and corporate levels; the graphical formats used to model data, information and knowledge are numerous. Flowcharts are standard along with value-stream maps, Gantt, statistical graphs, PERT and Six sigma control charts to mention but a few. The rather surprising fact is; we very rarely come across mind maps being used as a standard within business. I usually get someone looking over my shoulder wherever I may be consulting to, and while mind mapping. The almost standard line is; “wow that looks cool; what’s it for?” I must sound like an old recording by now when I go through the (admittedly) rather monotone delivery of what a mind map is. Though I do believe; with the deluge of data within corporations and information management systems, “mind maps” that can scale to accommodate data aggregation are critical. This problem of information overload is what gives raise to the whole field of knowledge management and more specifically data visualization, a close corporate cousin or big brother if you will, of conventional mind maps. I however call myself a Visual mapper, and not a mind mapper. While some of our colleagues may be confused as to definitions and terminologies, I firmly believe visual mapping to be a more expressive designation for the graphical toolbox available to us. Visual mapping includes but is not limited to mind, concept, flow and argument mapping. Of course there are more tools included; but for the sake of argument (pardon the pun), these tools adequately cover the graphical capabilities of Visual mapping. Visual mapping may be a useful term to bridge the gap and emphasize the common goal of both mind maps and other data visualization formats. Mark Wogan of Crystal Mapping states; “From an evolutionary point of view it, might help to view the term Visual Mapping as the next stage in Mind Mapping. Furthermore Visual Mapping 2.0 (VM2.0) could start to be a representative term for the aggregation of tools which utilize the cloud as well desktop software”. If I say “this is a visual map” while pointing to and using a flowchart, argument map, concept map and even a mind map; I believe this would be correct and accurate. Conversely, if I point to a flowchart, argument map and or even a concept map and say “this is a mind map”, I believe this would be incorrect and inaccurate. Shelley Hayduk (PersonalBrain) would differ and states; “it is fine to call these latter items mind maps, and Buzan-like conventional mind maps should not define what a mind map is”. Shelley goes on to state; “These conventional maps don’t allow for associative connections or the scalability necessary to truly reflect the complexity of human thought and interaction. So perhaps this term “mind map” needs to evolve… in the same way a phone at one time meant a rotary dial… it now means a touch screen with apps”. This may be an important analogy to remember". “In fact the very market confusion that this article points out might very well indicate the evolution of the “mind map” itself”. While I understand my colleague’s argument, I firmly believe there are obvious differences between mind mapping (single format) and visual mapping (multiple formats). Are you with me? Software products which find their origins in the mind mapping genre, have developed into excellent visual mapping products offering multiple formats of graphical expression. Apart from the generic radiant format, we now have the ability to toggle between organograms, input/output trees, and strictly linear formats that would lend themselves to flowchart type of outputs. 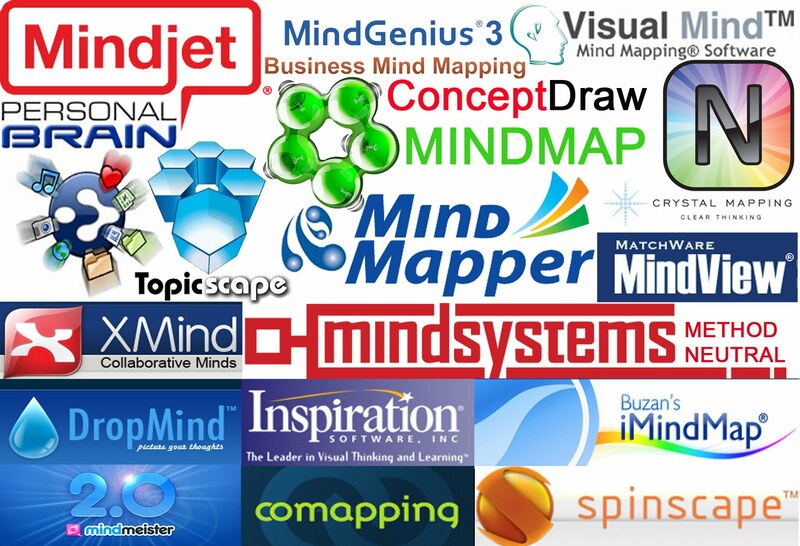 MindManager, ConceptDraw, MindGenius, Visual mind, MindMapper, MindView, NovaMind and Xmind are but a few of the leading products that have had their genesis within the Mind mapping genre. The obvious use of the term “Mind” is a remnant of the past influence of Mind mapping upon some of the mapping products that have evolved past the radiant format. And it would be misleading not to mention cloud computing as the potential driver for future information management trends. There are a growing number of graphical mapping services currently available for the discerning cloud user. MindMeister and Comapping are two notable leading SaaS mapping products. I agree with many of my colleagues who say; visual mapping and mind mapping genres may become rather passé, with regards to the continuous evolutionary processes of mind to knowledge mapping. Visual mapping is apparently developing into the knowledge mapping arena. Note; using the term arena, it’s merely convenient to do so. It’s clear we cannot identify an actual arena based on mind and visual mapping; apart from what software developers produce. We can however state a good case for knowledge mapping, or to be more precise, the move into Personal, Academic and Business knowledge management (KM). Many of our colleagues have continuously dialogued regarding stating a case for Personal Knowledge mapping for many years. Roy Grubb however states; “I think KM needs to be divided into two camps: Personal knowledge management (PKM) and Business knowledge management (BKM). The reason is that: (PKM) is alive and moderately well, aided by many products like Evernote, PersonalBrain and Topicscape. My discussions with KM professionals however tell me that BKM has not been an overwhelming success". "The reason is apparently a societal one. Extricating, recording and organizing the knowledge is too time-consuming on the one hand, and it goes against human nature to reveal knowledge that staffers may feel represent a significant part of their value to an employer. And getting people to use the stored knowledge is difficult. This is why Personal Knowledge Management is not suffering the same inability to get widely established". "The tools are not the problem. There is some excellent repository software, great library software, and even visual based software like Brain EKP”. Maybe by now you see where this is leading; knowledge management (KM) is the area covering the aggregation of data (numbers, words and images), through the information contextualization process, and ultimately through and into knowledge; see here. The knowledge portion of this process is rather interesting. This is where we develop a mindset that can be practically applied. 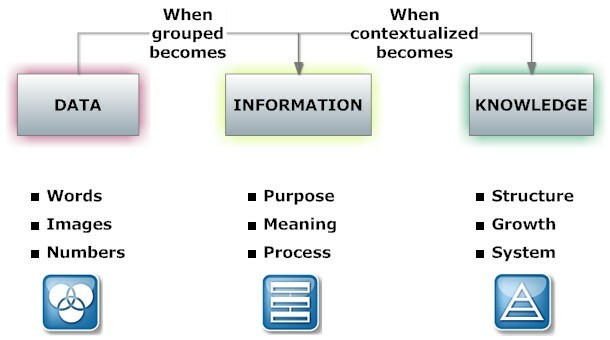 The mindset is the culmination of the data aggregation and information contextualizing processes, and this is where knowledge is realized; and applied. John England the founder of Mindsystems and the developer of the product named “Amode” is quoted as saying; “Information is the centre of the universe”. In context Mr. England was stating that, a mind map or single format is not the central function of any information management process or system, as some would have us believe. Mindsystems developed term called “Method Neutral”. It’s defined as: “Multiple modes of information expressed within a flexible workspace”. Mull that definition over in your mind for awhile, and I’m convinced the light will go on at some point for you; as it did for me. Many of our Visual mapping colleagues speak of the business application of KM within the constraints of software currently available. KM will surely evolve as all things do in the scale of development. We haven’t yet arrived at some kind of nirvana regarding information management, but it is clear we’ve come to a point of realizing mind and visual mapping is aligning with knowledge management. BrainEKP and Topicscape are good examples of this: products combining data visualization, content management, multi-user collaboration and search. These solutions may be viewed as a hybrid of the best and most relevant knowledge management features but with a visual interface. The visual map being the centre piece of the application and the other content management features support it. This solution illustrates how visualization/mind /or visual mapping can take center stage at corporate level. Both PersonalBrain and Topicscape are excellent Knowledge management products; offering a relational database approach to graphical knowledge mapping. They provide both new visualization interfaces and importing options. These products provide a more agnostic view as to where the solution fits on the visual mapping spectrum. While some PersonalBrain and Topicscape, and even Mindsystems Amode users will still use conventional mind maps, even store and launch them from their respective programs; and other users may simply replace mind maps entirely with one of these dynamic visual interfaces. Below is a collage reference to a choice of mainstream mapping products. Quite overwhelming isn’t it? Whether you use any of the referenced tools; you’ll more than likely evolve from being a rudimentary information mapper, and into a personal, academic and/or business knowledge mapper. This article is admittedly incomplete and awaits additions from many other more capable colleagues. It must end though where we should really be seed planting. Let’s laser focus on academia; infusing and integrating the tools, methods and mindset of visual mapping. Recently Toni Krasnic; the creator of the Concise Learning Method and author of Concise Learning stated; “Student success is my passion”. It is within academia where the thought leaders of tomorrow are nurtured, developed and released into the mainstream of industry and corporate business. Closing the gap between what academia produces and what the business world requires may be a prime directive. Academics do a great job, yet there is however a gap that exists between academia and business. Some of our colleagues see this as a chasm. This divide must be bridged with an understanding of the needs and wants of the industrial and business world in relation to knowledge management. Corporate business may be best positioned as a partner with academia. Business leaders understand the value add and usability of knowledge management. It may be practical for visual thinking business leaders to indicate their needs more clearly; in terms of what is required of future employees. 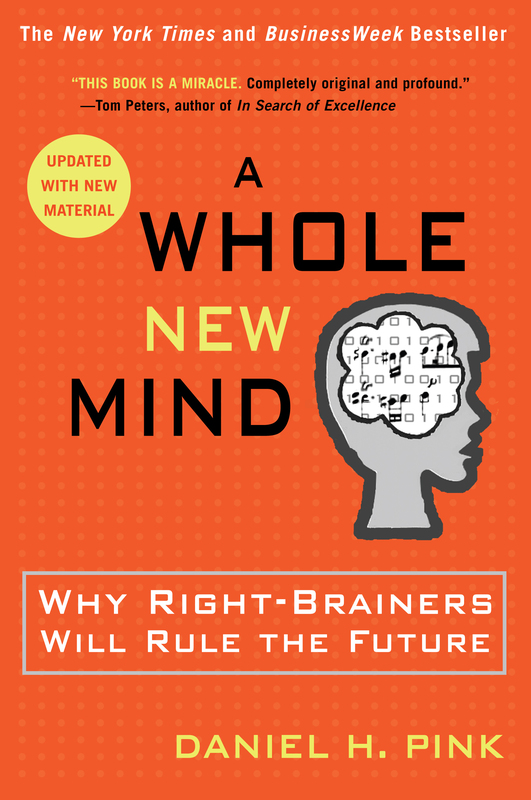 Within his Book “A Whole New Mind” Dan Pink indicated the need for whole brain thinking. We shall accomplish much by enabling whole brain thinking information managers, who use the tools, methods and mindsets of graphical thinking. We live in exciting times where the whole brain thinker has the ability to distinguish between, and use the power of both linear and non linear thinking. Professional associations, Bodies of Knowledge and certification processes are worthwhile initiatives, yet these initiatives may belong as a subset of established bodies such as Quality, Project and Knowledge management institutes. Creating a relationship with these institutes may be an ideal approach, as they already have their respective systems in place. The existence of established BOK’s and certification offerings may be where we mind-visual mappers find a welcoming home. The lack of professional cohesiveness and peer recognition within our so called arenas is problematic. We should solidify and validate our professional standing before considering and presenting a case for visual mapping inclusion to the mentioned bodies. This all sounds rather presumptuous; doesn’t it? Many of our colleagues, who are graphical thinkers, agree on one thing though; we simply have to associate with other institutions. This may preserve and continuously improve the use, infusion and professional recognition of our skill set and the visual tools we use. Having had a long journey of involvement within information management; it’s great to have apprenticed to a few of the thought leaders of the past 25 years. Much has been learned, and the learning process never ends. All in all, I believe there shall be a consensus to the intentions of this article. Giving credit where it is due. There’s been so much input and feedback from fellow colleagues listed below; this article has developed into a collaborative piece. How to manage your information more effectively? Every company is in constant struggle to improve 2 attributes above all; productivity and efficiency. These attributes can have a wide range of activities depending on the company and the industry they’re in, but let us talk about the meaning of those attributes in an office environment. There are many different strategies to approach these attributes, but I believe that productivity will increase by increasing motivation and minimizing confusion, and effectiveness will increase by increasing creativity. Given a normal work day at the office, people are prone to deal with many different ideas, challenges, meetings, assignments and I can only keep going if I am to form a complete list of activities. This brings to mind a vision for an application which makes an informational base. • Keep yourself up to date and think for the future. (1)Think about every time you come across something that you think might serve you well in the future, you usually write the stuff down. You jot it on sticky notes or write it on a blank sheet of paper, then it ends’ up being lost. (2)I have also learned that having many applications to work with, no matter how great they are, the situation proves to be prone to generate a long array of confused moments. (3)Meetings, assignment due dates, we all try our best to perform the best but sometimes that isn’t enough. This is why it helps to have one, base application, in which you record your information, from which you access your information, from where you manipulate with your information, and most importantly the base application needs to be as user friendly as possible. o The MS® Word integration. o The MS® PowerPoint integration. o The MS® Project integration. o The MS® Outlook integration. o The Google integration, which allows users to upload and attach Google Docs, and also allows importing Google Contacts in the mind map community; through which by using an advanced search allows searching the content of their Google Docs. Seavus DropMind™ has extensive options for export/import into another file type and they let your work become much more versatile in the way it gets handled. Imagine the freedom which you can enjoy. Let’s say that you have a map full of tasks, topics, attachments, notes and other info you may have placed. In other words, let us say you have an idea/project where you’ve organized your info on a map, and now you have to make few copies of the same content on a different format. For the sake of this example, let us assume you need to hand out a hard copy of the material, and you have to make a presentation of the same. Seavus DropMind™ lets you use many options in order to customize your export from within the application. This advanced approach to export/import (as shown on the screen shot) also applies for other file types. Among many, other notable feature is the advanced filter. This is a benefit which saves you time. You can use this filter to show or hide all your content which is related to a specific group of attributes (tasks, attachments, hyperlinks, notes and other) to save you on searching time. Also, you can summarize all the tasks on one topic along with all the tasks of its subtopics. Using this feature, a Project Manager can just come in to work and see today’s due dates for the team and themselves as well. I believe that creativity is what has brought us all to a level at which we are now, and from my professional perspective the top ranked information management applications are lacking the ability to trigger people to open up their minds. Instead of looking at a linear fashion, as I mentioned before, Seavus DropMind™ is displaying the information in a more dimensional and visual manner. This allows you to quickly recognize the priority level of a topic along with all its connections and dependencies and its current position status. Additionally, by saving you on searching time along with the benefit of visual perspective, Seavus DropMind™ has proven to force people to be more inventive, and has resulted in opening up people’s minds to fresh new ideas for solving a given problem. Handling a large load of sensitive information can get quite overwhelming. Also when working on the details of a particular project for an extensive period of time can sometimes result in a fading memory of the bigger picture. I think it would be good to be able to choose and switch between your points of view of your work. Look at the whole project from a “bird’s point of view “in order to grasp the bigger picture and minimize confusion, or look closer into the details to focus your work on a particular task or topic. Think about having one visual map were all the info you need is easy accessible saying “My Work”! Wouldn’t that be great!? This concept is a way of thinking, a visual thinking, which is not so widely spread but it keeps on positively surprising people in the business world. Our DropMind team prides itself in excellence, and we try to maintain that goal by always striving to deliver great customer service, and working on developing the application according to our user’s needs. We love every opportunity to listen to their wishes for improvement. You would have to experience Seavus DropMind™ yourself to know what I’m referring to, and to see the advantages. I am convinced that once you have placed your work on a DropMind map, and have it organized the way you want to, your work will become more creative and enjoyable! 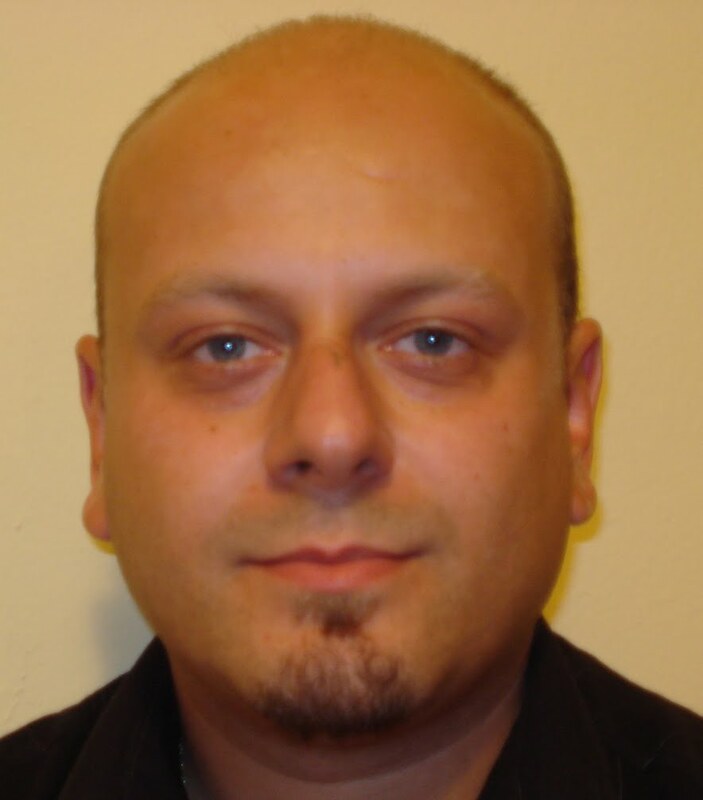 As current Product Sales Manager at Seavus; Angel Tanev is a technology driven, sales professional, who motivates his sales colleagues and clients. Seeking and finding an intuitive and inventive approach to spreading the voice and news of the Seavus organization is his forte. Angel has an advantage of being a success within product sales, and strives to expand DropMind’s presence and exponentially grow its sales. Prior to Seavus Angel enjoyed a successful position as a sales manager for Qwest Communications for 5 years.